"I had a real change in my emotions with one adjustment, is that normal?" 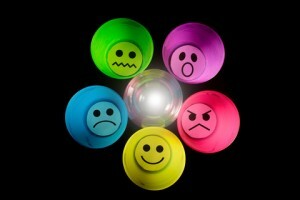 Can my mood be affected with adjustments?! Can a mere spinal adjustment influence my emotions? “Science is beginning to discover the physical and chemical connections between emotional state and physical condition. There have now been dozens of chemicals isolated which are known as Neuropeptides. These are small protein chemicals that act in the Nervous System as transmitters of information. But we are not just talking about knowledge, we are talking about feelings. Depending on what combination of these tiny hormones is running around in your body right now pretty much reflects what you are feeling emotionally. Most people think that these Neuropeptides reside in the brain, but it has been discovered that a good many of them are also residing in the spinal cord. Some can even be found throughout the body. When we begin to adjust the spine, some may experience some changes in physiology or emotions. As we peel back through layers of tension in your spine and spinal cord, memories and emotions attached to the point of tension can be re-experienced. If you are feeling an old hurt or like your mind is in a state of upheaval, it is likely due to these memories that have been stored in the body. If your spine is getting tight, your nerves get tense. If your emotions wind up, your spine winds up. When we release your spine, your emotions will relax. When you unwind your mind, your spine will release. Can I expect this to happen every time I have an adjustment? Or will my emotional responses diminish with time as my adjustments continue? Will the release of tension in my spine reflect on the emotional tension in my body every time? These are all wonderful questions! The answer is not simple. How your body responds to adjustments will always be your own unique experience. Want to explore on how adjustments affect emotions? Book your assessment with me, I’d love to help!